A quick caveat: MKF is nowhere near finished. 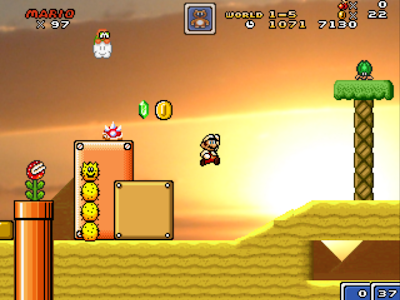 The dial on this game is still set firmly to debugging mode, with every level accessible without beating the previous stage (although there are a few levels on the standard issue Mario world map that can't be entered and I surmise are probably not built yet), areas set aside for tidal mechanics testing and a level close to the starting point which is full of bonuses including 99 extra lives (a reviewer's dream). Despite this it's still a lot of fun. 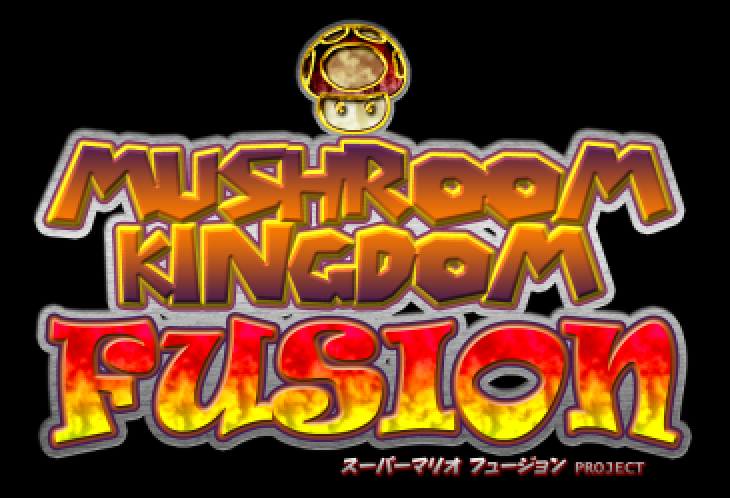 It's a Mario platformer, with loads of other lunatic stuff piled on top, so the producers haven't tried to reinvent the wheel with it - they've just covered the wheel with loads of really cool stuff and then set parts of it on fire. 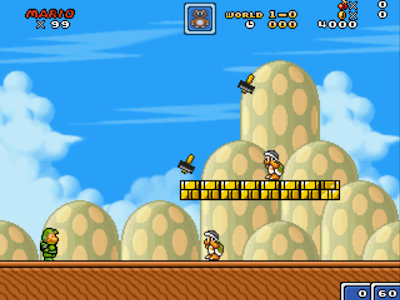 The game begins with our Italian hero in a familiar looking Mario world. The bonuses, enemies and chirpy music you would expect are there in full effect. 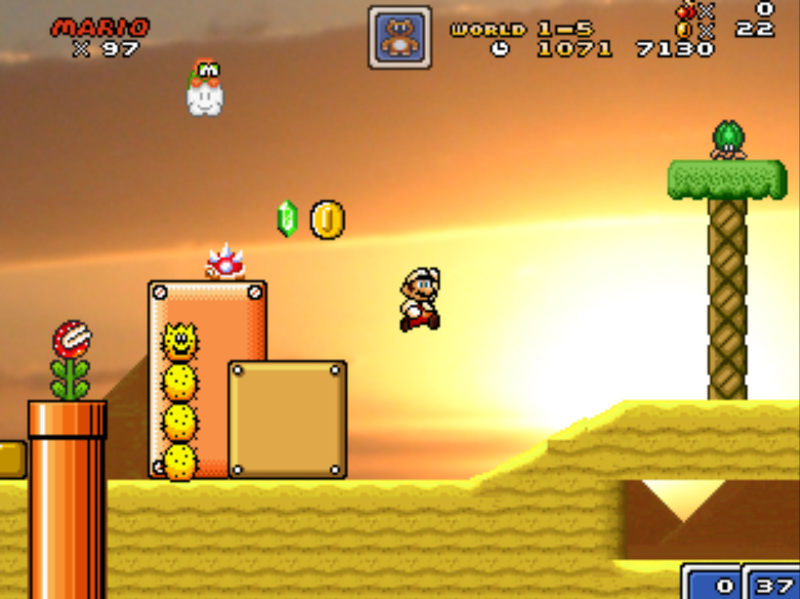 Fire-flower pickups, Goombas, Shy Guys, and lots and lots of pipes; it's Mario to the max. 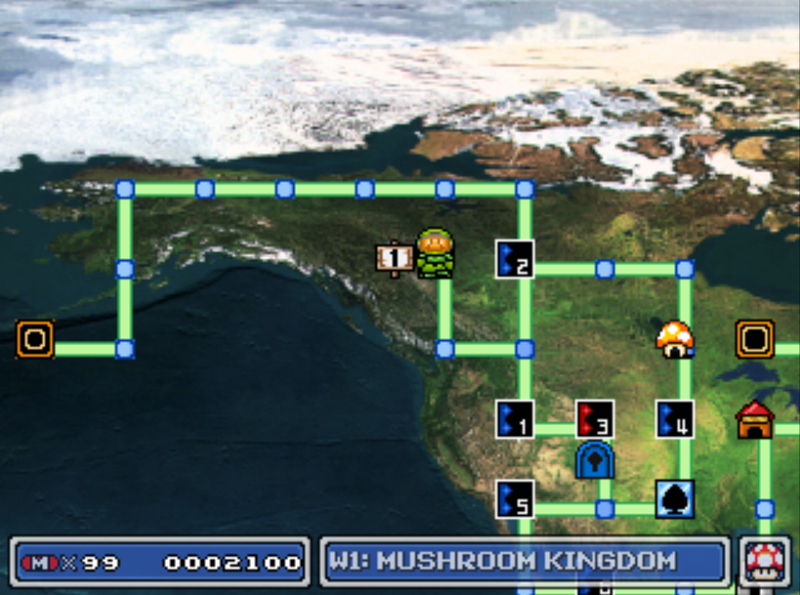 But battling through this first world (or at least you will when it's finished, but for now you can simply walk over the map to the pipe leading there) leads to an alternate Earth being invaded by all sorts of multi-dimensional bad guys. 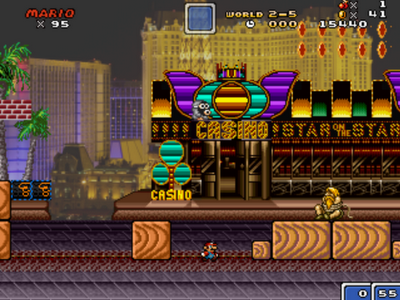 There's an especially well-realised Las Vegas level, all neon and funk guitar and pig cops from Duke Nukem 3D. From there the next target is a Mega Man world, and the worlds that follow are all pretty much spectacular. 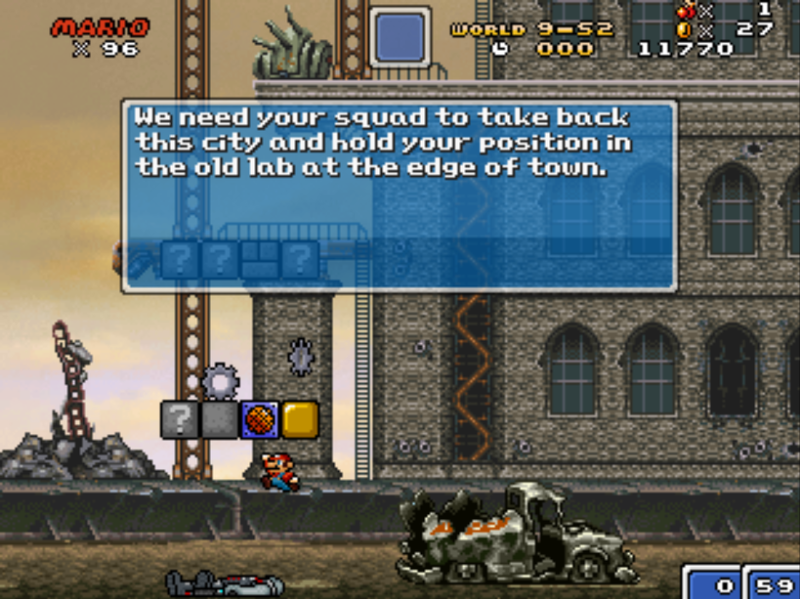 The Nintento Subspace world even features a Tetris level, and a stage where you team up with Bub (of Bubble Bobble fame). Level design seems consistenly good throughout, although a few levels are hard as coffin nails and difficult to beat without picking up the extra lives bonus at the start of the game. Although the majority of the artwork is clearly ripped from other games, the presentation throughout is brilliant, with lovely weather effects appear in some levels and others (like the aforementioned Las Vegas stage) just ooze atmosphere from every pixel. Seeing Mario dressed as a Halo space marine doing his little running-with-arms-held-out-like-a-little-Italian-aeroplane thing is worth the download alone. But this isn't a finished game by any means, and it's tough to engage with such an early stage beta as this. 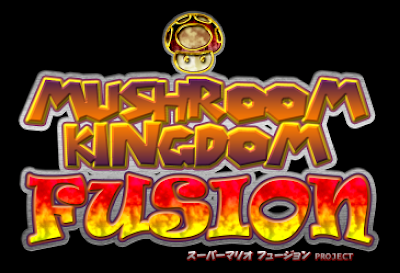 Even so Mushroom Kingdom Fusion is a little more gripping than the average beta, and it's certainly got this reviewer's interest piqued; I'm watching and waiting now for further developments and will hopefully even get to review this game once more when it's a finished product. 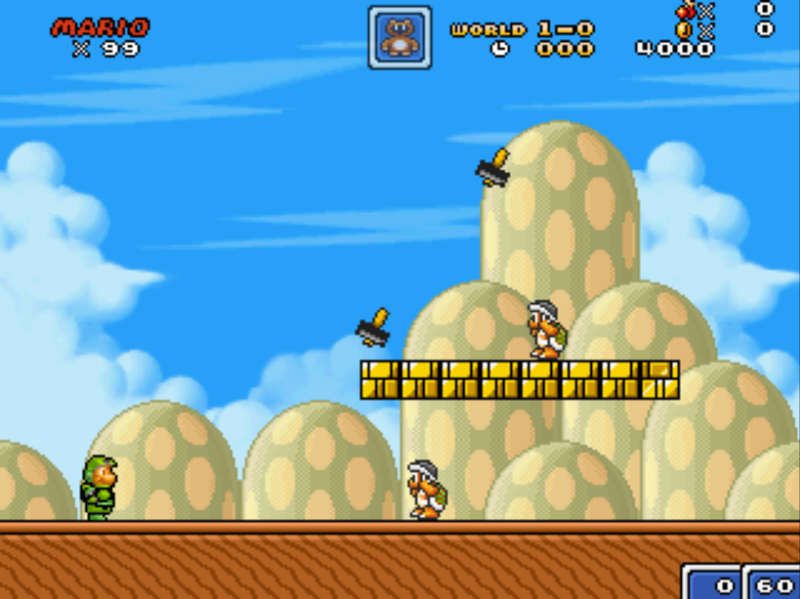 For now, leaping around blowing the hell out of things as Mega Man Mario is keeping me happily occupied. Download the game here (from the development forum thread). It's amazing that these fan projects manage to get this far without a C&D letter! To think how many different sprite rips and ideas are combined into this one. Looks great seeing Mario in the Metal Slug levels, will have to give this a try shortly!